“In the name of the Azure God Sword Dancer, I grant you the Guard of Order God Seal.” Lilibet raised her azure sword and lightly touched his forehead. With a flash of blue light, Yun Xi felt as if his body was washed by a stream of cold water. Something went into his body along with the cold feeling. “Done. Now, no one will find that you have borrowed Casina’s body.” Lilibet sealed the final trace that may expose Yun Xi’s identity and pointed at his chest. “My mark?” Yun Xi looked at the place Lilibet pointed at in confusion. Somehow, there was a mark of the chessboard on his chest. Raising the azure sword in her hand, Lilibet lightly patted it on his shoulder. Yun Xi looked at Lilibet, the girl of his dreams with expectations. 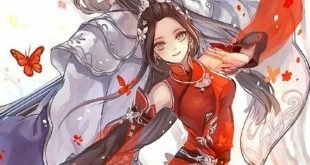 “If you want to see me again, come to the Sky Tower to take part in the trials, Master of Star Go.” Lilibet nodded in the response to Yun Xi’s question. “Then, I will be back.” Yun Xi found that it wasn’t a bad thing to be the Master of Star Go. “Goodbye.” Lilibet sheathed her azure sword and walked back to the golden seashore. In the distance, a group of wandering souls flew close to the Sky Tower. She brandished her sword, returning to her daily work, sending the lost souls back to the afterworld of forever silence. “Oh… I see… so it is…” Looking at her, Yun Xi realized that he was also one of the souls that were eliminated by her. However, he already could stand behind her and be recognized by her. “Thank you, Teacher Casina.” Yun Xi pressed the hourglass-shaped mark on his forehead and his body gradually vanished in the air. There were patterns of stars and a picture of twin sisters on the wall, which looked graceful and beautiful. Yun Xi was confused. Apparently, he wasn’t in the girl’s dorm. When did he come to this strange room? “What?! I have played Star Go three days?” He was shocked. Thinking again, it wasn’t a surprising thing. There was no day and night on the Starry Sky Chessboard, it was hard to know the exact time there. It wasn’t strange that 100 turns of the game had cost him three days. Because he found pleasure in it, he didn’t notice the passage of time. But, why did Star Thunder, Star Fire, and Star Snow possess my body? How could the three little guys play the role of maid perfectly? “Don’t worry, master. They did well. Actually, they did too well…” Suddenly, Mei’er’s voice became faltering, which made him have a really ominous presentiment. What happened when I was playing Star Go? Why did I wake up in an unfamiliar room? Whose room is this room? “Hey… Mei, you wake up?” He heard a familiar voice beside his side, which was so sweet that it could make people drunk. Star Thunder, Star Fire, Star Snow! What did you do? Yun Xi slowly looked back, and saw the girl’s snow white body. On the wide, white bed, the girl wasn’t wearing anything and was sleeping deeply like a beautiful begonia. Yun Xi really got intimidated when he saw the girl’s face. Red Lotus! The strongest hero ranked person in the White Lotus Sword Domain! Unsurprisingly, he saw the young sister of the twin witches, who slept on the other side of the bed. Compared to Red Lotus, at least White Lotus wore a white silk nightclothes. Although he could see a part of her tender skin from this angle, his face still turned red and his heart couldn’t stop pounding. Star Thunder, Star Fire, Star Snow! What happened?! Why am I on the twin sisters’ bed? Whoa! This is really a great crisis. “I’m done… Farewell, my dream of being a gentleman.” Looking at the defenseless sleeping twin witches, he only wanted to cry.